I’ve been taking my customary little break after a big essay series. My current plan is to spend the summer doing an occasional “Inexhaustible Moments…” series focusing on a specific year or time period. These are relatively easy for me to do (thereby keeping the blog alive), while the down time will allow me to enjoy some vacations and quality time with family. I plan on tackling the next full-scale essay series in September. Next up on the “Inexhaustible Moments…” random year generator: 1930. 3 Essays on Guy Maddin’s The Heart of the World (2000): I opened the blog with this goofy series that riffed on Maddin’s six-minute tour de force. It netted me the title of “Third Best Maddin-est Blogger in the World,” an honor I hold with pride. 21 Essays on The Golem (1920): I originally wrote this series for the IMDb Classic Film Board, then saved it to the IMDb’s Golem message board, and finally reclaimed it for this blog which is based on its essay model. 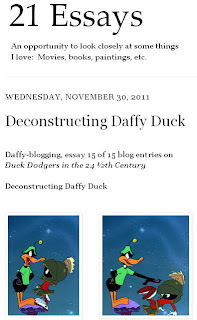 15 Essays on Duck Dodgers in the 24 1/2th Century (1953): I like the two-part structure that I used on this series and feel like I finally settled on the right tone for the blog. 12 Essays on “In the Bleak Midwinter,” a poem by Christina Rossetti: This was my first venture into writing essays on literature, religion, and music. 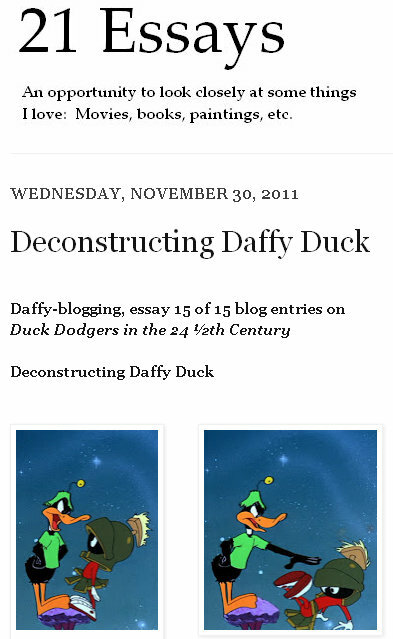 For it, I wrote 12 essays—one-a-day for the twelve days of Christmas. 15 Essays on Skull Island in King Kong (1933): For this series, I restricted myself to a thirty-minute section in one of my favorite films. It was fun tracking down some of the history, art, and science that inspired its creators. 6 Essays on Blackmail (1929): This was my contribution to the “For the Love of Film” blogathon and a welcome excuse to revisit some of my favorite Alfred Hitchcock and Michael Powell films. That’s all so far! More to come, I promise.